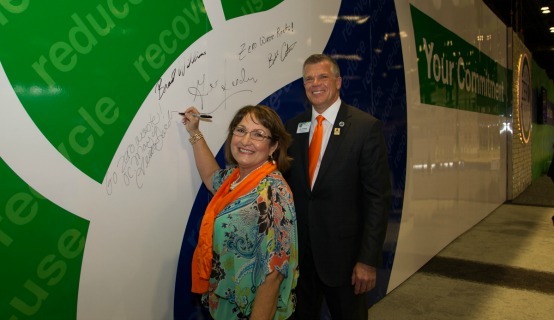 Orange County Mayor Teresa Jacobs welcomed more than 65,800 delegates from around the world this week to the Orange County Convention Center (OCCC) for the plastics industry’s largest global convention. With an economic impact of $129.6 million, NPE2015: The International Plastics Showcase brings thousands of professionals from 120 countries to Central Florida to preview the latest in plastics technology, innovation and equipment during the triennial week-long event. Long held in Chicago, the Showcase relocated to Orlando in 2012 and is produced every three years by SPI: The Plastics Industry Trade Association. The show draws recyclers, manufacturing technology experts and international and U.S. executives who make major manufacturing purchasing decisions that impact the world’s economy. The trade show’s 2,000 exhibitors displayed goods and 400 operating machines on 2.1 million square feet of space, which encompassed the entire Convention Center. The show freight totaled more than 20 million pounds. “Every sector of the plastics manufacturing industry is represented at this world-class event that attracts professionals across industries challenged with producing products we use in our everyday lives,” said William R. Carteaux, SPI president and CEO. Mayor Jacobs was a guest of honor for the 2015 Plastics Industries Hall of Fame Induction held the night before the Showcase’s opening ceremony. Carteaux and 10 other leaders in the plastics industry were inducted into the Hall of Fame, which is located at the University of Massachusetts at Lowell. Mayor Jacobs issued a proclamation at the opening ceremonies for the Showcase declaring March 22 through March 28 as NPE2015 Week in Orange County. SPI: The Plastics Industry Trade Association represents nearly 900,000 American workers and is the third largest manufacturing industry in the United States. Mayor Jacobs walked the convention floor with Carteaux, meeting exhibitors and welcoming domestic and international visitors to Orange County. A unique fashion show opened this year’s conference. “Pursuing Zero Waste Fashion Show” featured one-of-a-kind designs made from post-consumer recycled plastics by students at the Savannah College of Art and Design in Atlanta. A collection of photos from the 2015 Plastics Industries Hall of Fame Induction and the opening of the NPE2015: The International Plastics Showcase is available for use by the media and are located on Flickr.